JMP 10 introduces a snazzy way to create control charts with a new platform called Control Chart Builder. JMP's prior Control Charts were designed over two decades ago for the classic process engineer in manufacturing and were past due for an overhaul. The more we listened to which customers were running control charts and how they were using them, the more I was surprised to learn that people from nearly any field, including health care, medicine, sales, banking, scientific fields and education were running control charts. This was when we realized JMP needed something easily accessible to everyone. The new Control Chart Builder platform in JMP 10 works much like Graph Builder with a drag-and-drop interface. It displays an Individual and Moving Range chart the instant you drag over a Y, and switches to an XBar and R chart when you drag over a subgroup column. 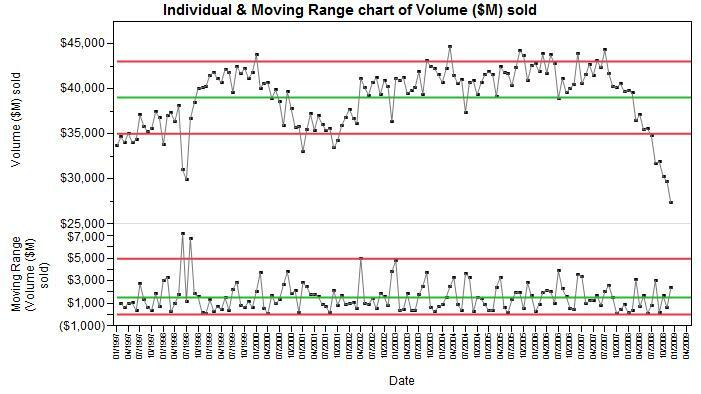 Since sales managers are on alert for low-volume months and always looking to repeat high-volume months, the limits on Control Charts can be useful in sifting out the noise from the more interesting events. The car sales volume data in this example comes from the U.S. Census Bureau, Economic Indicators. In the plot above, we first notice the drastic drop in volume for June and July 1998, caused in part by the General Motors labor strike. In 2008, we see the deep continued drop in sales resulting from the 2008 recession. The blue reference line is set at December, 2007, which the US National Bureau of Economic Research states was the beginning of the late 2000’s recession. To see just the top (Individuals) chart, simply click on the axis label for Moving Range and drag the label out. We hope you will find Control Charts are more fun to drive now. Will JMP 10's Control Chart Builder have a way to switch to Levey Jennings or other types of control charts? Yes! The Control Chart Builder turns the control chart inside out, letting you set the statistics used for the points and limits separately, which makes the control charts more flexible. To switch to a Levey Jennings chart, you need only change the sigma used to create the limits. To do this, right-click on the graph and choose Limits->Sigma, then Levey Jennings. Take a look at both the Points->Statistic and the Limits->Sigma menus and you'll see many other types of control chart choices. How did you get the date on the x-axis? I only see "subgroup" on the x-axis. When I go to put the date on the x-axis for the independent and moving range chart, the graph changes to an Xbar and R chart. I want to maintain an independent and moving range chart with time on the x-axis. Thanks for your question. Youâ re correct that the variable on x-axis acts as a subgroup variable. In this example, all the dates were unique, so the subgroup size was one. The only time it switches from an Individual and Moving Range set to an Xbar and Range set of charts is when the subgroup size is greater than one. Is it possible to show a trend line on an SPC chart, similar to what can be added to a line chart in Excel?